Calyx Retrofit was established in May of 2013. Started by Robert Brierley and George Constantinides. 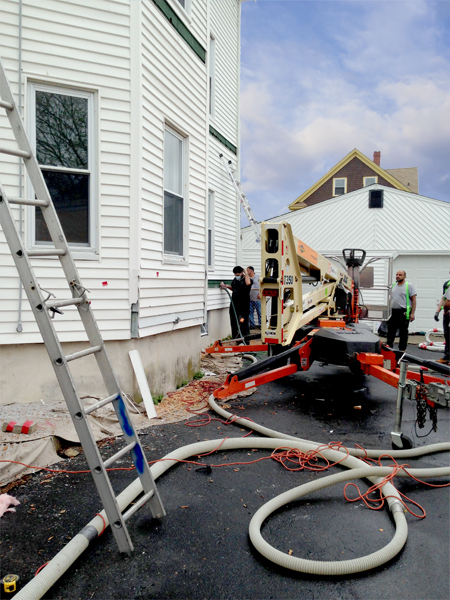 Calyx Retrofit is a full-service weatherization company based in RI. Calyx Retrofit provides insulation and weatherization services for all phases of construction, including new construction, remodeling, and retrofitting. Define insulation/insulate: The act of protecting an object by surrounding it with material that reduces or prevents the transmission of heat, sound, or electricity. From the Latin host word “insula” – to make into an island”. Full background checks for all employees including criminal record, driving history and drug testing. Crew Chiefs have 30 hours of OSHA safety training and lead safe training. Approved weatherization contractor for multiple programs in Rhode Island and Massachusetts. To conserve energy, make homes warmer.